Are you engaging your clients and prospects by using Twitter? If not, click the “back” button on the browser and read some of the other great articles on TRO or head on over to the TRO Community. If you are active on Twitter, listen up. This week, I discovered what I think might be a game changer in terms of follower engagement. And of course, if properly executed, follower engagement will result in business. Now to be honest, when I first discovered it, I was not sure if there were any benefits. But after only two days, I am already seeing results. The concept is fairly simple. You are the “publisher” of an online newspaper and everyone in the Twitterverse are your reporters. And it is free! Here is how it works. The program scans all public twitter feeds for you. It can be based on your followers, select keywords, hashtags, or select twitter users. 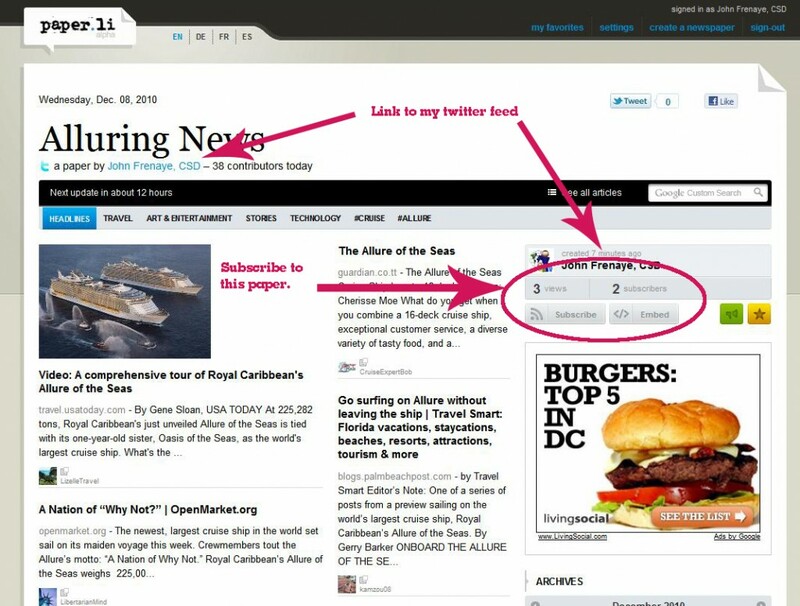 It will aggregate the tweets, check out any links and organize them in a coherent newspaper-like presentation. It gives credit to the original twitter user, but it is brought by you. Here is how it benefits you. Let’s say you are promoting a group on the Allure of the Seas. Doesn’t it make sense to promote it to those who are interested in…the Allure of the Seas? You create the newspaper (I just created this literally a few minutes ago) and now you have a URL that is nothing but Allure of the Seas news complete with photos, articles, and video. You arrange your settings to promote this automatically via twitter and a tweet will be broadcast linking many of the contributors. And since we are all vain and like to see our names, they will undoubtedly follow the link to your paper (remember, it is already something of interest to them), subscribe to your paper and likely begin to follow you where you can further engage them with your group. If you scroll down, you will also note that the paper has a special box highlighting just your tweets. As with all social media, you are not supposed to be selling. You are engaging. Do not worry that a competitor might pop up on “your” newspaper—people know that you provided the information. You have become the defacto expert for this audience. The image above indicates that there have been three views and two subscribers—not bad for literally three minutes; and as that base grows, the reach of the paper’s “voice” will also grow exponentially. I think this business has a shot at success. They are obviously getting revenue from the Google ads on the site and if there are hundreds of thousands of these papers, the money is likely significant so there does not appear to be a threat that this will turn into a pay service. News of your followers. Everyone has you in common, this will allow you to see what everyone else who likes you likes. News for particular keywords. Honeymoon…cruise…Viet Nam…destination wedding…Occidental Resorts…you get the idea. News for particular tweeters. Create it based on following NCL, Carnival, Royal Caribbean, etc. and you have an “insider” newsletter. Give it a try. From the Alluring News, there is a link at the top to create a newspaper. Poke around and make a few (you can add and delete as needed) but use the custom settings and really define your topics. Make sure you promote it on Twitter and I say publish it twice a day to hit as many twitter users as possible. This program is in “alpha” which is one step before “beta” and three steps before “ready for prime time,” but you have a chance to get on this wave and ride it risk free. Changes are happening daily and a Facebook integration is in the works. But when that is released, be very careful. If you do not maintain separate identities (personal and business) on Facebook, it could backfire on you with disastrous results.